Here it is! Time for my Christmas Card picture! I only take the picture, mind you. If you’re expecting a card, then it’s probably not going to happen. Jus sayin. I’m a dog, for Pete’s sake. So, in lieu of a card, take a peak below– and then read the 5 reasons to like it. Reason #5. The Subject Matter. Let’s face it: I’m adorable! I’m really not too sure how much more I need to say about this one. All you have to do is take one look into my deep brown eyes, and you just won’t care about me getting on the sofa. It’s a proven fact. Half the time, I can even Occupy the Bed. What other 3-legged dog can get away with that?! Reason #4. It’s Green. I’ve got the real live dead tree, not the fake dead plastic tree. There’s a debate every year about this issue, but I say this one we cut down in the field over the hill for $15 was a real deal… and green… and very local. It’s not petroleum-free, but it’s closer to green than a factory tree, methinks. 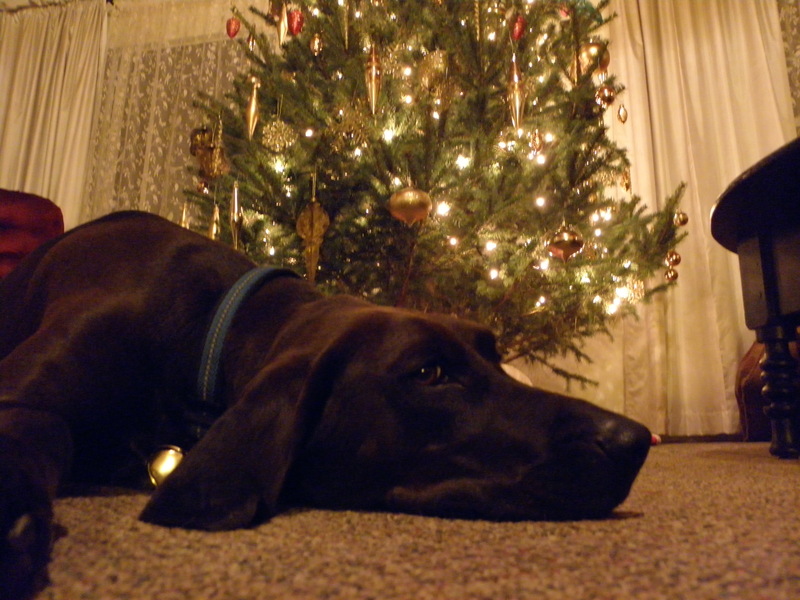 FYI: You are not allowed to drink from under the tree. Reason #3. It’s Green. That’s right, it’s really green. Rather than sending out a bunch of cards that also come from cut-down trees, which are then processed in a factory and shipped, then reshipped to each of you– all I did was upload the photo to my blog. That’s got to be green, right? Green’s so good I can even post more than one picture. Reason #2. It comes with a song. Did you notice my jingle bell collar? With a noise like that, there’s no human who can stand nearby without singing, “Jingle dog, jingle dog, jingle dog dog dog…” Sometimes, passers-by even throw loose change at me. The bad thing is that there’s no way I’m sneaking into the kitchen because everyone will know it (however, I refer you to Reason #5). Reason #1. Don’t it just feel like Christmas? Remember that Folgers commercial where “Peter!” announces he’s home by making coffee? Why does that comercial capture human interest so much? What rings true about it? There’s nothing like home. “Home” is deep– and something important to think about at Christmas-time. Is home where your heart is? Or is your heart where your home is? The first way, because your heart is a part of you that goes with you, your home goes with you. The second way, your heart has to stay at a place called home. Like if you ran the bases in baseball, you’d leave your heart behind at home. Don’t do that. It wouldn’t make for a nice Christmas. Where ever you are in life, know that home isn’t a location… it’s a symbol. The thing the symbol stands for can never be separated from you. Gallery | This entry was posted in Popular Stuff, Uncategorized and tagged 2011, blog, christmas, christmas card, christmas tree, dogs, funny, green christmas, green holiday, holiday greeting card, holidays, home, ideas, inspiration, life, love, meaning of home, personal, pets, philosophy, photography, photos, pictures, three legged dog, writing. Bookmark the permalink. 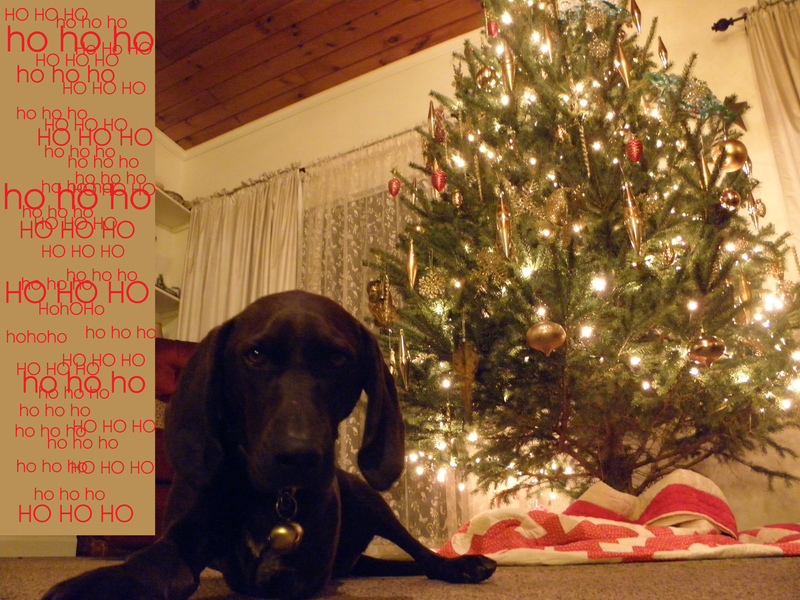 Ada, I love your Christmas card and all the good reasons for it too. It’s awesome! Merry Christmas to you!!! Love the card and your blogs. It gets me thinking and speaking out. I also like the snow on the last two blogs. Merry Christmas and a Wonderful New Year! Remember it is a wonderful life. Pooch…you’re gonna get a smooch when I finally meet you. Merry Christmas!